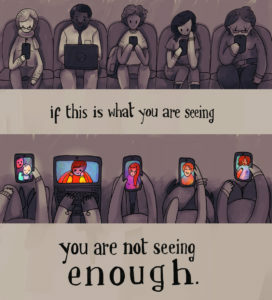 I was taken aback this week with yet another photo of a crowd of people, at a public show, “preoccupied” with their cell phones instead of watching the show like they should. 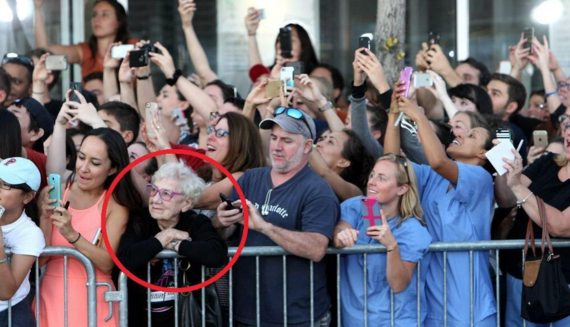 There was one older woman in the picture, no cell phone, obviously using the wisdom of her age to have put her phone down and enjoy her time in the moment. Social media is in fact designed to feed our need to keep the stimulus in front of us. That’s how free media is often funded – advertising, making us consumers. That indeed can be a huge concern, and warrants mindful intention. However, I’ve grown to see technology as a tool that also can help us navigate a complicated world. Cell phone apps are pretty amazing right now. They can translate text, connect us with information, let us be more independent and make more choices on how we live in varied situations. Often, it seems many complaints about social media and technology is concerned with social isolation. Of course that is always a concern. I wonder though if that is related to the tool itself, or how we make decisions to use it. Go back to that picture I mentioned – a large crowd, “all on their phones”. Really? I do not think I have enough information to make that determination. Yes, many of the have cell phones. Are they not also paying attention to what is going on around them? Are they sharing the experience, in real time, or recording it for later to share with friends who can’t be present? What about people whose phones help them manage their access (like bluetooth hearing aid apps, or programs that translate languages, or change a visual display that makes text easier to read or hear) in situations. Would these folks even be able to be here and fully present if not for their phones? Certainly, each person has their own needs and concerns. I am deeply grateful for the connections and friendships that I can support and engage in on social media. I do not feel isolated – but more connected. Does this work for everyone? Of course not. Does it mean I am not also sometimes wrapped up in social media, and connections in virtual places that disconnect me from those in front of me? Of course. I’d suggest perhaps instead of making blanket statements on whether something is “good” or “bad” for everyone – we ask a better question. Is this the right tool for the work in front of me now? Is there a better tool for my being in the world right now in the way that I am called? Can this device, or technology be used in a different, more intentional way? Is it time to put this tool away and use another? Sometimes the tool of technology is helpful, and makes our lives easier and some things possible. Other times, it can indeed not be needed. 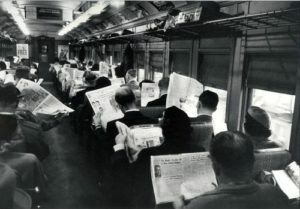 Distracting technology on a train! I think about Quaker plain dress as a “technology” too sometimes. Plain dress allowed Friends to live more simply, to not worry about choosing clothing, and therefore to have more time for their call from God. For some, it still does. For other Friends, plain dress became a competition of who could be the “most” plain – or have expensive, hand tailored hats and clothes. Not simple at all. Maybe we as humans always have to watch for temptation of being distracted, or being involved in activities and concerns that take us away from our deeper call of service to others, of embodying God’s love in the world, of being who we are called to be. For me then the test of technology reverts to use, to intention, and to being open to continuing revelation and learning about how the tools of modern technology be helpful and not a burden.